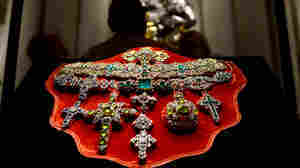 October 30, 2013  For the first time, 70 pieces of the Treasure of San Gennaro — said to be more valuable than the British crown jewels — have been transported from a vault in Naples to a museum in Rome. The collection highlights historic gifts from European leaders, including Napoleon. June 22, 2010  Madeleine Albright's "Read My Pins" exhibit of the brooches she's worn to augment her diplomatic efforts is on display at the Smithsonian in Washington, DC.